The sound of Beaune late at night is very strange. I am here sandwiched between the main tourist season and that time when a percentage of northern Europe moves south for skiing, using the town as a refuelling stop; a chance for the first big night out of their winter holiday. For the present, Beaune feels as though it's holding its breath. I walked back from dinner a few minutes ago, through pedestrian shopping streets strewn with Yuletide decorations, past shops majoring on children's clothes - bedecked with headless, handless, footless mannequins, creepy observers of my passage in the still, cold and damp air - and a handful of shoe shops intent on servicing the needs of people addicted to crepe soles and comfy beige uppers. It was a journey both mournful and surreal. 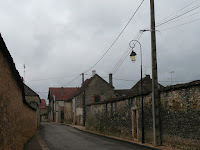 The day started with a car ride north to Gevrey. There was a dusting of snow on the slopes that rendered some the colour of fag ash, the majority of the landscape remaining the sterile brown corduroy typical of this leafless season. We started at Domaine Dupont-Tisserandot in Gevrey. Didier Chevillon's a relaxed sort of guy. His wines speak volumes, with lots going on between the lines. Gevrey to Chambolle and Domaine Sigaut. I went there last year and tasted extensively (as I did this). A year ago, my visit coincided with the day that all the wines were racked from barrel into large stainless steel tanks, there to spend a couple of months coming together before bottling. So unsettled were they that I couldn't bring myself to pass judgement on them, let alone buy them to offer. This year, better luck. The wines were a great deal more accessible and luckily for me, I was offered another chance to taste the '06s. A very fine source. Is Chambolle the new Vosne? From Chambolle we headed up into the Hautes Cotes: the vineyards and villages occupying the high rolling plateau above the Cote d'Or. We met an ambitious young man: Aurelien Verdet. Aurelien's just built a new winery, decked it out with shiny stainless tanks, new-looking presses. His wines are mighty impressive. Mike tries to reason with a young man (Aurelien's 27) determined to raise his prices in a nightmarish economic situation. If Mike turns out to have been successful, I will offer these wines. Lunch. In Beaune. Gesiers to start, then a chunk of charolais beef to follow. Everything below my breast bone groans when we get up to leave. Jean-Pierre Charlot is son-in-law of Joseph Voillot and makes the wine at this exemplary estate. He is larger than life, his size not reflected in the delicacy of the wine he makes. We are offered a string of Volnays and Pommards, each more intense than its already intense antecedent. These are beautiful, subtle, complex wines, pale in colour yet exhibiting all the multifaceted personality of which Pinot Noit is capable. A joyous visit. From Volnay to Meursault. The Domaine Michelot Mère et Fille has become Domaine Bernard-Bonin. Apparently this occurred before we offered the brilliant 2006s under the former name, so I will have to update those who bought the wines. There will be no disappointments. We tasted the 2007s and the 2006s and they are all, to a wine, stunning. We have a little 2006 remaining from this estate and those seeking out these remnants will be highly rewarded! …for which we sit down in La Ciboulette: a noble establishment not far from the ancient archway marking the original gates to the town. A delicious bottle of Corton from a producer unknown to me acted a superb backdrop for the usual fine fare that La Ciboulette offers, all supplied via the tireless Isabelle, diminutive maitresse d'. A fine day; a great many fine wines. And a great deal of talk about whether any of them will sell!